Posted on September 6, 2014 by Hawaii's Local Buzz. If you’re a true coffee lover, one cup in the morning is just not enough! Adding coffee to some of your favorite foods is a great way to enjoy its delicious flavor throughout the day and to ensure that you don’t waste a single drop. There is a secret to using leftover coffee — never leave your brewed coffee sitting on a hot surface (like the “warmer” built in to many automatic drip coffee makers). Decant your fresh-brewed coffee into a thermal carafe as soon as it’s done brewing, and then refrigerate any leftover coffee for later use. Hawaii’s Local Buzz 100% Hawaiian Ka’u coffee is ideally suited to refrigerated storage as it is an amazingly low-acid coffee that retains its character even after a week or more of refrigeration. Add it to your chili. 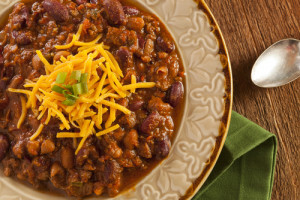 It may seem like a strange chili ingredient, but coffee rounds off the flavors of a pot of chili, offering a subtle balance to its traditional spice. About 1/2 cup of coffee in a 2-quart pan of chili should do the trick. Make coffee oatmeal. Instead of mixing your oats with milk or water, mix them with some leftover coffee. The result is a rich, aromatic breakfast that’s delicious topped with a little cinnamon or some cherries and dark chocolate. Make coffee ice cubes. Simply pour the coffee into ice cube trays and freeze it. The next time you make iced coffee, use these coffee cubes in place of regular ice and your drink won’t taste watered down at the end. Flavor your frosting. Pull out your favorite frosting recipe. A classic one that calls simply for powdered sugar, butter, and milk is best for this purpose. Use coffee in place of the milk or other liquid for a tasty treat. It’s lovely on both cookies and cakes, and you can even spread it on graham crackers for a mid-day snack. Make mocha brownies. Use coffee in place of the water in your favorite brownie recipe or boxed brownie mix. The result is ultra-rich and deeply satisfying; you’ll have trouble going back to regular water ever again. Visit Hawaii’s Local Buzz to stock up on our 100% Hawaiian Ka’u coffee, macadamia nuts and other special Hawaiian treats.